Original fairy problems published during 2012 will participate in the informal tourney JF-2012. Warm welcome to Arnold Beine – famous German problemist and also an editor of fairy section of world-famous German magazine Die Schwalbe! Maximummer: Black must play the geometrically longst move or may choose from among longest moves of equal length, distances being measured from the center of each square. Diagonal and oblique distances are measured from the orthogonal coordinates by using Pythagora’s theorem (take the square root of the sum of the squares of the orthogonal distances). 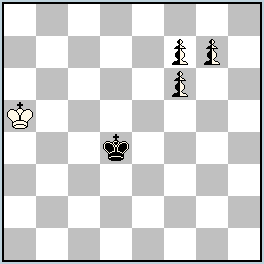 All other orthodox chess rules apply. Dont know why. My Popeye shows a quite different solution starting 1…f8S. Probably I am doing something wrong.